Note: Any questions or concerns, for more product detail information, please go to the bottom of this product describe page or directly contact us. Q: Do I need to order an alarm panel for this camera and wireless sensors? 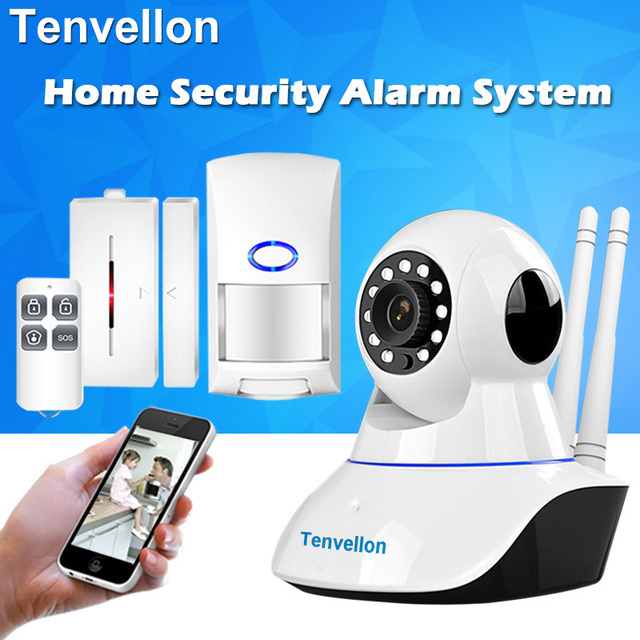 IP camera with alarm system function, it can work with wireless sensors as an alarm system. Q: Can I add extra sensors to work with this camera? IP camera alarm system can add wireless zones, it can work with extra sensors like wireless gas detectors, smoke detectors, co carbon detectors, door/window sensors, PIR motion detectors, water leakage sensors, IR beams, vibration sensors and glass break detectors and so on.Only need to pay attention to device frequency 433mhz. Make sure the frequency match. Q: Does this IP camera with night vision function? What is the distance I can see at night? Q: Can I order 2 cameras or more to work with same sensors so I can monitor and protect different house? Yes! After you connect wireless sensors with 2 or more cameras, it can send the alarm signal to all the cameras when it is triggered. Q: Does the camera with movement detection? A: Yes! The user can enable the "movement detection" by using APP, and when it detect moving objects, the camera will take a photo and send it to user's email, and the APP on the mobile phone will receive alarm message. Q: What is the resolution of the camera? A: This is the 720P camera in 1.0 megapixels. Q: I bought a camera before, can I add extra sensors? A: Please make sure your camera support 433mhz frequency alarm function, if you are not sure, please contact the camera seller first. High Definition network camera applies 1.0 megapixel CMOS, and supports resolution 720P(1280*720), fully meeting the application requirements of high-definition images; It is equipped with highly integrated processor, extremely low power consumption, super stability to ensure image quality, mobile phone remote monitoring; WIFI network search and access， It also supports SD card front-end storage, providing a more convenient way and a more reliable safeguard. 5, Supports Android Phones or Tablet, iPhones or iPad, Windows PC CMS software remote view. supports most home/family level WiFi routers, DO NOT support enterprise level WiFi routers with WPA/WPA2 encryption.